For those who have opted to forget this particular drawn-out saga, Assange still faces extradition to Sweden, where he’s wanted for questioning in two cases of sexual assault. He claims it’s all a ruse to extradite him, eventually, to the United States to face espionage charges. If he steps foot out of the embassy, Assange risks an encounter with British police — a guard has been waiting for him out there for two years, “at a cost of more than $10 million,” the Times reports. “The situation must come to an end,” said Ricardo Patiño, an Ecuadorean foreign minister, at today’s news conference. “Two years have been definitely too long. 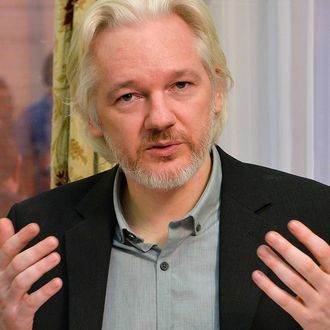 It is time to free Julian Assange, it is time for his human rights to be respected.” It’s also probably time for him to shave.